Unfortunately, almost immediately after the doctrine had been accepted by the United Nations, efforts were made to subvert the requirement of broad consensus. This in essence took two forms. The first was the claim that, if the situation was extremely serious, then there could be no time for consultation. The second was relentless pressure with regard to selected situations, with continuing calumny of any countries that resisted such pressure, in the expectation that they would finally give in. Efforts to project Sri Lanka as an R2P situation had begun shortly after the Rajapakse government took office. It began as usual with the British, presenting to the Human Rights Council in Geneva in 2006 a resolution critical of the country. At that stage the plan seems to have been to hold the resolution over our heads like the sword of Damocles, since it was decided that the resolution would be tabled, ie suspended, with the possibility of introducing it again the following year. The strategy was perhaps based on the assumption that the regime change that some individuals hankered after might be possible in 2007 and, if it were thought desirable, concerted external pressures would assist. In accordance with this strategy perhaps was the effort made by those who were running the International Centre for Ethnic Studies in Colombo to set it up as a Regional R2P Centre. Their chosen tool for this purpose was a lady called Rama Mani, introduced and indeed thrust into the role by Radhika Coomaraswamy, who ensured that no suitable Sri Lankan candidate applied for the position. 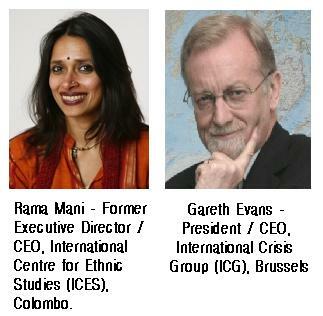 That is another story, which only emerged later, but just before the September session of the Human Rights Council, at which the British ambassador endeavoured to activate the resolution against Sri Lanka, Rama Mani invited a once distinguished politician called Gareth Evans to deliver the Neelan Tiruchelvam Memorial Lecture. In her letter she encouraged him to make waves, and he certainly did so, in describing Sri Lanka as a situation that was ripe for the R2P doctrine. Gareth Evans had been Foreign Minister of Australia, and responsible to a great extent for the settlements in Cambodia, which is perhaps why Western governments still insist that those worked out very well. After then prestige he gained by that little operation, it seems that he has been looking for yet anotherr another grand role, and had been one of the leading figures in the development of R2P. Palitha Kohona, my predecessor as Head of the Peace Secretariat, who had worked with Gareth previously, suggested that he saw himself as a substitute for the Norwegians as facilitator of the Sri Lankan Peace Process. Certainly Gareth was quite critical of the Norwegians when we met, and I suspect Palitha was absolutely right about Gareth’s quest for a new role. In addition to his involvement in the Global R2P Centre, Gareth headed something called the International Crisis Group, which had been issuing regular reports on Sri Lanka that, whilst not supportive of the Tigers, were quite critical of government action. These were drafted it seemed by the ICG representative in Colombo, who at the time of the Tiruchelvam Lecture was a young man called Alan Keenan – who turned out to have known Rama Mani previously, I believe from having studied together with her. 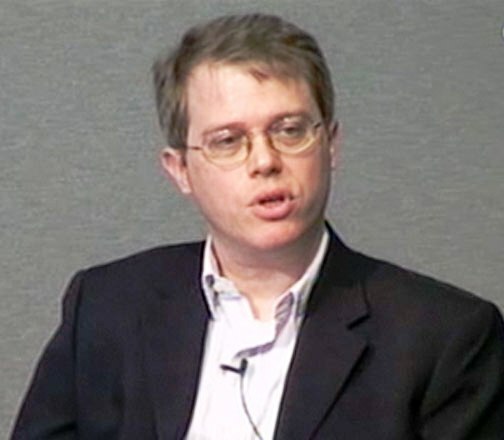 Alan Keenan - Senior Analyst, International Crisis Group (ICG). Gareth’s lecture turned out to have been written by Alan Keenan for, when he was challenged about falsehoods in it, he turned to Keenan to ask for an explanation. Most grotesque of these were the suggestions that there had been genocide and ethnic cleansing in Sri Lanka. Keenan’s explanations referred to events in the eighties for the first, and to the expulsion of the Muslims by the LTTE for the second. However the thrust of the lecture seemed designed to create the impression that it was the Sri Lankan state now that was responsible for such excesses. The Tigers were to all intents and purposes let off the hook, and Gareth managed, in the speech Keenan had prepared for him, to commemorate Neelan Tiruchelvam without any reference to who had killed him and why. Gareth claimed that it had not been his intention primarily to insinuate that the Sri Lankan government was heading towards disaster, but promised when I cited passages from the lecture to respond to a detailed written critique of the lecture. However all I got when I wrote was a deafening silence. When I confronted him with this when we met in Geneva a year later, he first claimed that he thought he had replied, and then admitted that he felt I was a difficult person to deal with. I took that as a compliment, but suggested that he had an obligation to follow up and he agreed, but of course neither he nor the ICG policy making staff in Colombo responded to further correspondence. Fortunately Gareth has now given up his ICG role too, and I am told that the latest ICG report on Sri Lanka is not as critical of the Sri Lankan government as during the days when efforts were being made to divert us from our efforts to eradicate terrorism from our midst. 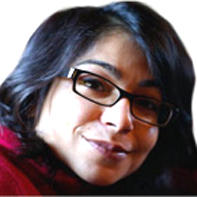 Charu Lata Hogg - Associate Fellow in the Asia Programme at Chatham House - UK, and South Asia researcher with Human Rights Watch. Naturally Gareth’s pronouncements received much publicity in August, as did a diatribe against Sri Lanka produced by Human Rights Watch. The author of that was a lady called Charu Latha Hogg, who also seemed to come from the same stable as Rama Mani and Alan Keenan. Her report, or rather the publicity for it, was full of falsehoods, claiming for instance that there had been indiscriminate attacks on civilians during the liberation of the East. In fact the report itself indicated that there had been only one instance, in the whole operation, of civilian casualties, and that had been due to mortar locating radar, the Tigers having used weapons from an IDP camp. Human Rights Watch too failed to respond to detailed refutation of their claims, after one casuistical effort to suggest that details did not matter. All this of course was obviously designed to rouse feelings against us in Geneva. The British Ambassador, convinced that he had us in a vice, approached our Ambassador and said condescendingly that he was prepared to negotiate the text of a resolution. Fortunately Dayan Jayatilleka was well prepared, not only because he had studied the situation, but also because the British Ambassador was not entirely popular with his colleagues, although he claimed to act on behalf of the European Union. Dayan made sure, making use of a delegation led by Minister Mahinda Samarasinghe, that the Ambassadors in Geneva were well briefed, and soon Nick Thorne realized that there was no hope of his resolution being accepted. The sword that had been held over us for a year had to be put away, and he was gracious enough to tell me, if grumpily, that our Ambassador had won. However, he added that this was for the moment, and we should wait and see how the situation developed. Fortunately for us he had retired by the following year, and was replaced by someone who seemed much less aggressive. Thorne had been talked of as a possible Ambassador to the UN in New York as the next step in his long career (he had joined the British Foreign Office when he was under eighteen, and I used to think of him as a former child soldier), and I detected a trace of disappointment when he told me that had not worked out. I suspect that perhaps that would have been his reward if he had handed his masters our heads on a platter – but perhaps this is mere fancy, and what would have been fatal for us was not significant enough for the British to have treated it as a matter of any consequence.